These rooms are ideal for smaller meetings or 1-2-1 discussions with clients. Each room can accommodate a maximum of 20 to 25 people depending upon how it is set out. This is a great room with superb natural light due to the windowed roof. 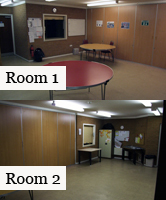 This room can seat around 40 people again depending on layout with built in visual equipment. This is the largest of our rooms actually within The Wesley Centre and can accommodate 150 people seating in conference style. Audiovisual equipment is not built into this room but can be made available if needed. All of our rooms have kitchens attached which are available upon request and depending on available for you to make refreshments etc.